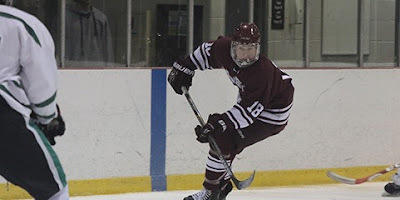 The Quinnipiac Bobcats picked up another verbal commitment today this time from 1999 born defenseman CJ McGee who announced it via a twitter post. McGee is the second Pearl River, NY native to commit to the Bobcats following Liam McLinskey. The 1999 born is a 6'0, 181 pound left shot defenseman currently with the Shreveport Mudbugs after being a tender to them before the season. He is off to a blazing start with 17 points (5 goals, 12 assists) in 22 games played and is a plus 11. His 17 points rank him tied fo first on the Mudbugs in scoring and he is also 5th among NAHL defenseman for points. Prior to playing with Shreveport, McGee played five seasons for the North Jersey Avalanche program from bantam all the way to the U-18 level. He also was a two year captain at Don Bosco Prep in NJ. When McGee tendered to play in Shreveport last March for this season the Mudbugs director of scouting Mike Grattan said this about McGee. "CJ is a top two-way defender that we have been tracking over the last few seasons. He is a leader and is the type of player and person that will excel in Shreveport." McGee is the third former Don Bosco Prep player to commit in the past few seasons following John Campomenosi and current Bosco senior Liam McLinskey. Congrats to CJ and his family and welcome to Bobcat Nation. You can follow the BobcatsHockeyBlog on Twitter @QHockeyBlog.